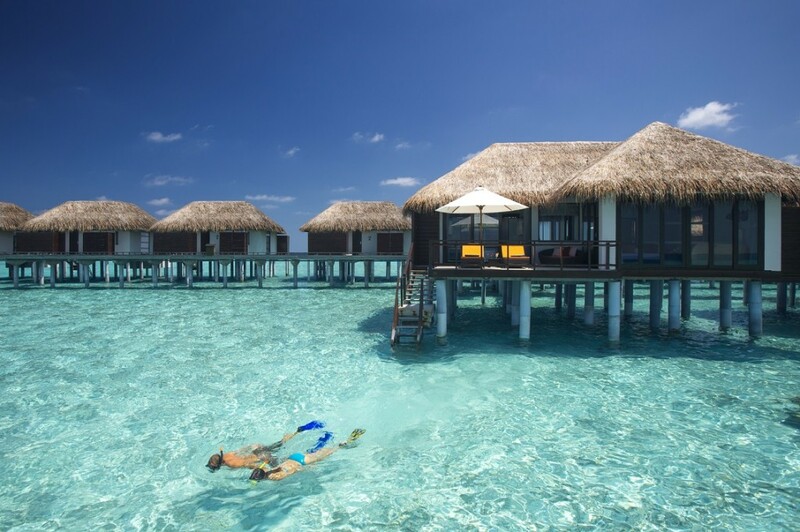 Whether you are making the Maldives your only destination or part of a trip to Sri Lanka, Thailand or India, you will not want to miss the Velassaru Maldives. 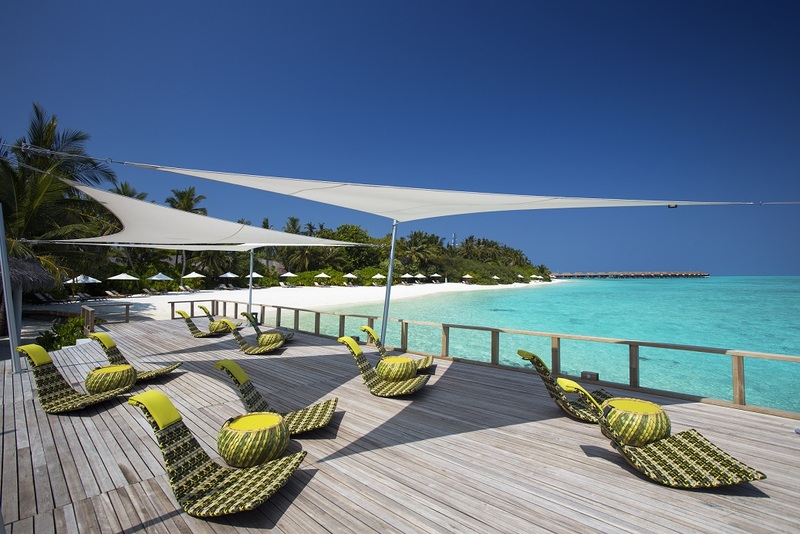 Only a half hour by boat from the Ibrahim Nasir International Airport on the island of Male, the Velassaru describes itself as Luxury Undressed, where minimalist contemporary chic meets comfortable natural elegance. The property offers 8 room types. Like most of the properties in the Maldives, you have your choice of a land villa or a water villa, with or without a pool. But, to truly experience the ultimate that the Velassaru has to offer, you must stay in the Water Suite, an impressive 2900 square foot private one bedroom hideaway. At the end of the jetty, behind a privacy wall, your private 24-hour a day butler will fulfill your every need. Not interested in sharing a beach with the other property guests? 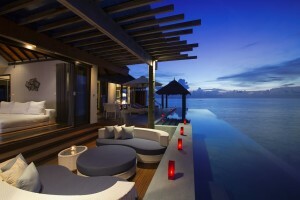 Then indulge in the private oversized infinity pool and spacious sundeck with multiple sitting areas. Don’t want to visit the wonderful restaurants? Have dinner brought to your outdoor dining area. And of course, enjoy the oversized bathtub or indoor shower. You can even watch movies on the oversized TV in your living room, but why bother. You are on vacation in one of the most beautiful oceans in the world. Turn on the Bose music center, sit outside and watch the sun set while you sip on your favorite holiday spirits. That is not to say that you must stay in the Water Suite to experience the amazing things that the Velassaru has to offer. The entry level Deluxe Bungalow, at 793 square feet, offers stylish design, a luxurious garden bathroom with refreshing outdoor shower and an open terrace where you can sit and enjoy the serenity of the property. Or you can go up from there, adding a pool, an ocean front view, or an overwater experience in a 1200 square foot Water Villa. While at the Velassaru, you must find time for at least one Spa treatment. Make sure you get there early so that you can soak in the outdoor hydropool perched over the lagoon. 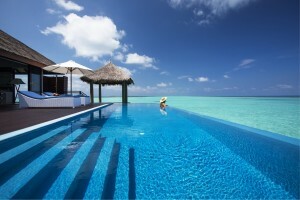 Then enjoy a couples massage in one of the 10 overwater treatment rooms. Pass on the standard massage types, such as Swedish, Sports and Balinese. At the Velassaru, their 90 minute house massage uses authentic coconut wood tools to liberate negative stress in the body and stimulate positive and intensive sense of well being. If you have more time, try one of the 2 ½ hour Ritual packages. 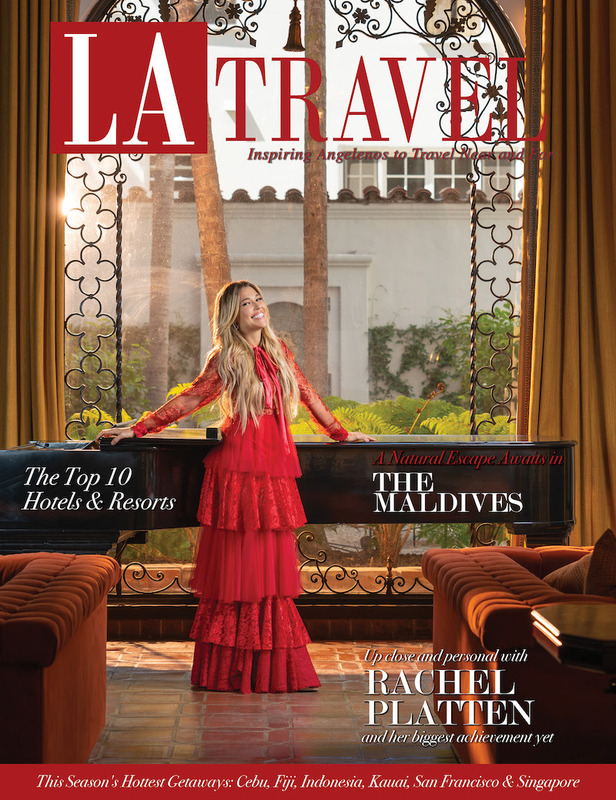 Nourish and regenerate with the Tropical Ecstasy, Detoxify and Revitalize with the Oceanic Delight, or experience the Maldives with the house ritual, which uses local and natural ingredients including a Lagoon Coral Scrub and Virgin Coconut Oil Massage. It is hard to chose which of the 8 restaurants to eat at, they are all so good. 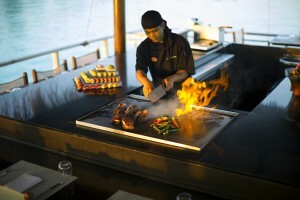 Make sure that you eat at the Teppanyaki restaurant. 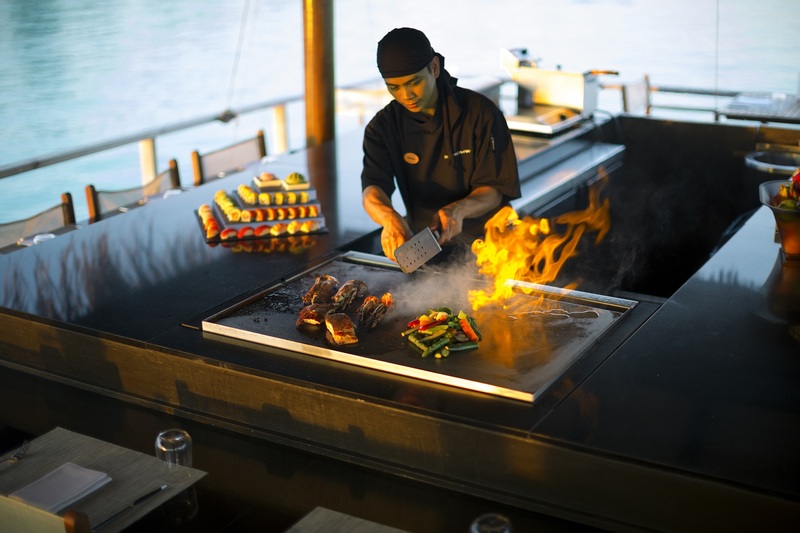 Situated over the water, you can be seated outside or at the Teppanyaki table itself. Much of the sushi and seafood is fresh caught that day. Our favorites were the Lobster with Spicy Lemon Garlic Sauce and the Grilled Scallops with a Ginger Vinaigrette. The food at the Teppanyaki restaurant is not your typical Japanese cuisine. For an even more unique experience, try Sand, the property’s Grill restaurant, where the tables are either on the powder white sand or in open air pavilions with thatched roofs. Enjoy the amazing views and the Maldavian sunset as you eat wonderful dishes such as the Maldavian tuna tartar and prawn tempura for starters, and a wonderful selection of grilled meats and fish. But make sure that at least one of you tries the Maldavian Chicken and Prawn Curry. The Indian and Sri Lankan influences on Maldavian food are truly captured in this exciting local dish. 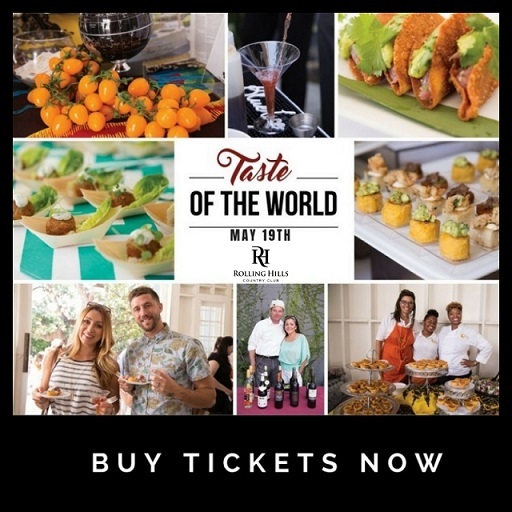 Add the Turquoise (international cuisine), Pizzeria, Fen Bar, Chill Bar (Tapas), Etesian (Modern Mediterranean) and the Vela international buffet and you have more than enough choices. The Velassaru screams romance and is particularly popular with honeymooners, and the private dining choices are as varied as the restaurant choices. If you have the time, try the Private Satay Barbecue. Not only is the food amazing four courses at sunset created and served by your own chef and waiter, but you sit on comfortable chairs made of sand, carved out of the beach. Add candles surrounding you and you have a truly unique dining experience. Don’t forget why you flew all those hours to the Maldives in the first place, the water, big game fishing, dolphins, snorkeling, water sports, and of course, the diving. Catering to both the novice and seasoned divers, the Immersion Dive Center can show you some of the best dive sites in the world. Leave your dive equipment at home, the Immersion Dive Center has everything you need. Want to learn to dive? This is the place with the Dive Center’s PADI Certified Instructors. Want to learn a specialty? Nitrox, Advanced Open Water, Rescue Diver, Digital Underwater Photography Certifications are only a small portion of the available courses. The dive instructors and dive guides know all of the best places to see reef sharks, eagle rays, napoleon wrasses, corals, schools of snapper, jack and tuna. When you get to that last night at the Velassaru, and you know that it’s almost time to get on the boat back to the airport for the trip home, enjoy the sunset cruise on the property’s Dhoni, the traditional Maldavian fishing boat. Champagne, canapés and the sunset. It just does not get any better than this. Prices at Velassaru (reservations@velassaru.com or +960 665 6100) for 2015 start at US$705 for a Deluxe Bungalow on BB. Inclusive of return boat transfer. Including Taxes and Service Charge. Visit velassaru.com for further information. 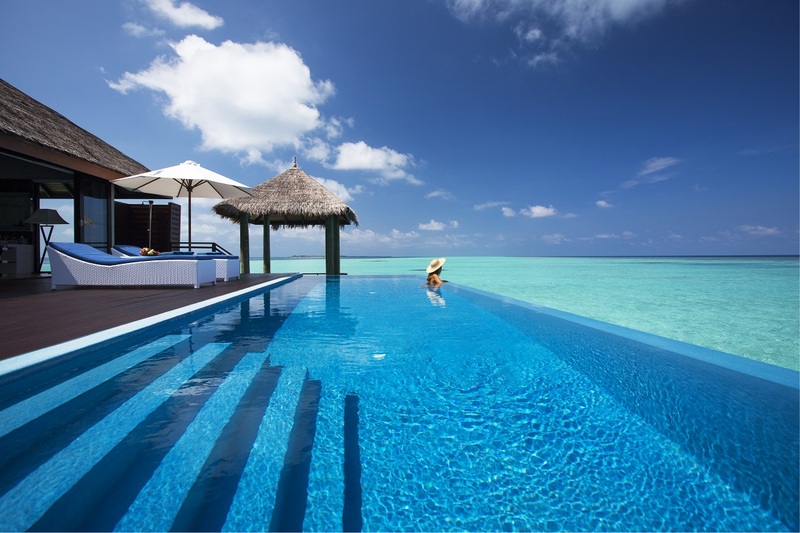 This entry was posted in Asia & The Pacific, Hotels and tagged luxury resort, luxury travel, maldive hotel, maldives, velassaru, velassaru maldives.